3. Hunan Key Laboratory of Nonresolving Inflammation and Cancer, Disease Genome Research Center, The Third Xiangya Hospital, Central South University, Changsha, Hunan 410013, China. Tumorigenesis is a complex and dynamic process, consisting of three stages: initiation, progression, and metastasis. Tumors are encircled by extracellular matrix (ECM) and stromal cells, and the physiological state of the tumor microenvironment (TME) is closely connected to every step of tumorigenesis. Evidence suggests that the vital components of the TME are fibroblasts and myofibroblasts, neuroendocrine cells, adipose cells, immune and inflammatory cells, the blood and lymphatic vascular networks, and ECM. This manuscript, based on the current studies of the TME, offers a more comprehensive overview of the primary functions of each component of the TME in cancer initiation, progression, and invasion. The manuscript also includes primary therapeutic targeting markers for each player, which may be helpful in treating tumors. Currently, ten major characteristics of cancer have been universally recognized, including unlimited multiplication, evasion from growth suppressors, promoting invasion and metastasis, resisting apoptosis, stimulating angiogenesis, maintaining proliferative signaling, elimination of cell energy limitation, evading immune destruction, genome instability and mutation, and tumor enhanced inflammation (Figure 1) . Although researchers now have an understanding of most characteristics of cancer [2-30], the characteristics regarding cancer formation, which is the focus of the current study, remains unknown. After the 'ecological therapy' strategy was widely employed , much effort has been devoted to determining how cellular and noncellular components of the tumoral niche help tumors to acquire these characters. These cellular and noncellular components of the tumoral niche comprise tumor the microenvironment (TME). The TME consists of extracellular matrix (ECM) as well as myofibroblasts and cellular players, such as fibroblasts, neuroendocrine (NE) cells, adipose cells, immune-inflammatory cells, and the blood and lymphatic vascular networks . Furthermore, TME has increasingly been shown to dictate aberrant tissue function and play a critical role in the subsequent evolution of more stubborn and advanced malignancies . Oncologists have also found that when the microenvironment in a healthy state, it can help protect against tumorigenesis and invasion. By contrast, if it is not in a healthy state, it will become an accomplice. The intent of this paper was to summarize the existent knowledge on the potential role of each TME component in tumorigenesis: initiation, progression, and metastasis, respectively. We have also summarized some of the main cellular players, such as cancer-associated fibroblasts, immune and inflammatory cells, blood and lymphatic vascular networks, adipose cells, neuroendocrine cells and ECM in the TME, as well as their corresponding targets in TME, in the hope of providing some clues for future TME research. We have also introduced the therapeutic target markers for various parts of TME based on the current research results. The tumor microenvironment and characteristics of cancer. 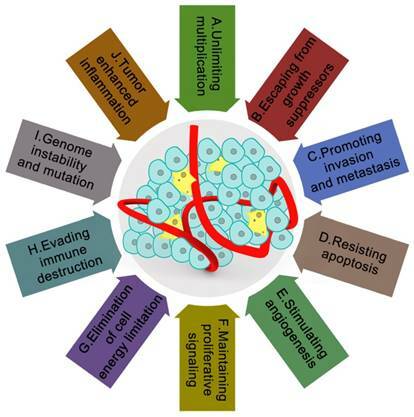 It is currently widely recognized that tumor microenvironments are wildly influenced by the ten main characteristics of cancer: A. unlimited multiplication; B. escaping from growth suppressors; C. promoting invasion and metastasis; D. resisting apoptosis; E. stimulating angiogenesis; F. maintaining proliferative signaling; G. elimination of cell energy limitation; H. evading immune destruction; I. genome instability and mutation; J. tumor-enhanced inflammation. Lower cure rate and poor prognosis of cancer patients are closely related to these ten characteristics of cancer. These ten characteristics make cancer more mysterious within the complex tumor microenvironments. A sub-population of fibroblasts with a myofibroblastic phenotype in cancerous wounds is distinguished as cancer-associated fibroblasts (CAFs). After activation, fibroblasts are known as CAFs or myofibroblasts [34-36]. During natural wound repair, myofibroblasts are transiently present . Unlike the process of wound healing, CAFs at the site of a tumor remain perpetually activated, as in tissue fibrosis. Several studies have demonstrated that only the activated fibroblasts are required to initiate and promote tumor growth [38-40]. Fibroblast activation may be induced through various impetuses when tissue lesions occur, including growth factors, direct cell-cell communication, adhesion molecules contacting with leukocytes, reactive oxygen species , and microRNA [42, 43]. When the fibroblasts remain activated after the initial insult has regressed, these activated fibroblasts may work with other molecular pathways to boost neoplasm initiation. These CAFs have a significant impact on cancer progression through remodeling ECM, inducing angiogenesis, recruiting inflammatory cells, and directly stimulating cancer cell proliferation via the secretion of growth factors, immune suppressive cytokines, and mesenchymal-epithelial cell interactions [41, 44]. For instance, Galectin-1 overexpression in CAFs advances the development of abutting cancer cells  and is correlated with poor prognosis in several types of cancer, including breast and prostate cancer and laryngeal carcinoma [46-49]. Chemokine (C-X-C motif) ligand 12 (CXCL12), violently uttered in CAFs, may induce epithelial-mesenchymal transition (EMT) of cancer cells to promote cancer progress in gastric and prostate cancers [50, 51]. Moreover, one team discovered that MMP-2, derived from senescent CAF-CMs, induced epithelial invasion and keratinocyte discohesion into collagen. Interleukin-22 (IL-22) is also expressed by CAFs to encourage gastric cancer cell invasion through STAT3 and ERK signaling . Using a 3D invasion model, another study found that HCT116 cells manifested a substantially invasive phenotype, while media originated from human dermal fibroblasts (HDF) . Since myofibroblasts can be distinguished by alpha-smooth muscle actin (α-SMA), laminin-1, transforming growth factor beta (TGF-β1), vascular endothelia growth factor A (VEGF-A), etc. [54, 55], CAFs have been recognized as playing an essential role in the metastasis and development of cancer . Oncologists have found that through HGF, TGF-β, platelet-derived growth factor (PDGF) etc., CAFs may promote tumor growth and invasion (Figure 2). Through fibroblast growth factor 2 (FGF2), VEGF, etc., CAFs may promote tumor development by promoting angiogenesis . Additionally, CAFs also interact with immune-inflammatory cells and neuroendocrine cells through different cell factors and cytokines to jointly promote the initiation, progression, and invasion of cancer [58-62]. However, many of the markers that have been gradually proven to be unable to identify all of the CAFs, are not unique to the CAFs . The cardinal functions and the primary markers of CAFs are illustrated in Table 1. For instance, α-SMA, one of the previous major markers of CAFs, was found to be expressed in normal fibroblasts , pericytes, and smooth muscle cells . The cell-surface serine protease fibroblast activation protein α (FAPα), which is highly expressed in quiescent mesodermal cells in multiple tissue types , is also not specific to CAFs. Additional markers fibroblast-specific protein 1 (FSP-1) , vimentin, and certain proteins, including NG2 (Neuroglial Antigen-2), platelet-derived growth factor receptor-β (PDGFR-β), fibroblast-associated antigen, and prolyl 4-hydroxylase have been shown to be expressed in cells other than CAFs . The function of cell players in the tumor microenvironment. The blood & lymphatic vascular networks VEGRF3; LYVE-1; CD31; CD34; VEGF*; PlGF*; VEGF-B*; VEGF-C*; VEGF-D* Require nutrients and oxygen; Evacuating metabolic wastes and carbon dioxide; Helping to escape immune surveillance. Adipose cell AIs*; MBD6* Producing circulating blood estrogen; A major energy source; Relating with inflammation; Recruiting immune cells; Support vasculogenesis. Neuroendocrine cell NSE; CgA; K18&K8 cytokeratins; PGP9.5; Ki-67; IL-2; KE108*; DLL3*; EGF* Extending lumina and adjacent epithelial cells; Regulating secretion and motility; Controlling lung branching morphogenesis; Providing a protective niche for a subset of lung stem cells. Note: *, the targeting markers. The inactive network of cancer cells and the tumor microenvironment. Similarly, although there is no unique marker, there are still some targets for significant help in cancer treatment. CAFs work in two main ways in cancer treatment. One method is by directly reversing CAFs into the normal fibroblasts or inhibiting their growth. This method highlighted that efforts such as reconstituting miRNA expression had been proven to deactivate CAFs [68-70] and inhibit PDGF signaling in the mouse model of cervical carcinogenesis; it can also reduce tumor proliferation . Additionally, the fibroblast growth factor receptor (FGFR) signaling pathway may be one of the therapeutic objectives in gastric cancer .The other objective is dedifferentiating CAF into a quiescent state. One data set showed that Vitamin D receptor (VDR) ligands promoted the dedifferentiation of satellite cells and abrogated fibrosis . Using a murine xenograft model of colon carcinoma, another recent study found that when targeting fibroblast activation protein (FAP), the accumulation of CAFs was markedly reduced . FAP is expected to become another marker of CAFs targeted therapy. The main function of the mammalian immune system is to monitor tissue homeostasis, to protect against invading or infectious pathogens and to eradicate damaged cells . The primary theory advises that immune surveillance has significant roles in recognizing and eradicating a large part of nascent tumor cells . However, unlike normal functions, immune-inflammatory cells would persist in sites of chronic inflammation, linked to diverse tissue pathologies, including fibrosis, aberrant angiogenesis, and neoplasia . In light of recent discoveries in immune system research, it is difficult to ignore the crucial issue that immune-inflammatory cells may be the early cradle of cancer [77-83]. Several studies have revealed the contribution of adaptive and innate immunity in cancer immunoediting, including the unmanipulated innate immune system without adaptive immunity . Dunn et al. divided the dynamic process of cancer immunoediting into three steps: elimination, equilibrium, and escape . These three stages can also be used to express the role of the immune system in cancer initiation, progression, and invasion. He pointed out that in the elimination phase, the immunologic system can defeat nascent tumors. This is accomplished by different inflammatory cells [86-88] and signaling molecules [88, 89]. Once cancer cells have been completely eliminated, these active factors and immune cells may have an additional role in producing “immunologic sculpting” or “immunoediting” . This means that in the equilibrium stage, tumor cells cannot be completely cleared, but the tumor growth can controlled. In order to escape the immune surveillance, cancer cells tend to evolve a number of phenotypic changes in this stage, such as EMT . These cells, with survival advantage, would eventually develop into the primary solid tumor. In other words, the immune microenvironment helps cancer cells to select the dominant cells so that the tumor can progress at the fastest rate in a limited environment. Several studies in mice have revealed that the depletion of macrophages during tumor induction restrained tumor growth [91, 92]. Regarding the escape stage, the immune system may help tumor cells to format the clinical characterization of tumor immune escape mechanisms, while many experiments have proven that immune cells can reduce anti-cancer proteins or cytokines to promote cancer invasion [93, 94]. In addition, one experiment also found that immune cells may be related to the regulation of apoptosis . However, the greatest divergence between these transitional immune cells and the other stroma cells is that these immune cells can be redesigned toward the tumor destruction in therapies. How to activate the normal function of immune cells will be the focus of a future study. As depicted in Figure 2, CAFs , NE cells , adipose cells [98-100], and inflammatory cells [101-103] in the TME can affect the role of immune cells through the secretion of different cytokines, cell factors, or interacting proteins, which adds several difficulties to the search for markers and targets for cancer therapy [104, 105]. In different cell and tumor types, the complexity and heterogeneity of immune factors also provides a further complication to finding more specific markers of the immune cells. The immune system is divided into adaptive immunity and innate immunity. Adaptive immune cells include thymus-dependent lymphocytes (T cells), and bursa-dependent lymphocytes (B cells). Innate immune cells consist of dendritic cells (DC), killer lymphocytes, natural killer (NK) cells, hyaline leukocyte/macrophage, granulocytes, and mast cells . According to the different clusters of differentiation, T cells are divided into CD4+ T (helper T cells, Th) and CD8+ T (cytotoxic T cells, Tc) cells. These secrete IFN-γ, TNF-α, and IL17, which have antitumor effects. B cells are mainly marked by different antigens in different physiological periods, such as mainly expressing CD19 and CD20 in pre-B cells, immature B cells, and plasma cells, mainly expressing IgM, IgD, and CR1 in mature B cells, and mainly expressing IgM, IgD, IgA, IgG in memory B cells. A key feature of human NK cells, which could efficiently recognize infected and malignant target cells, is the expression of HLA class Ⅰ-specific receptors of the KIR and NKG2 gene families . DCs express co-stimulatory molecules and innate inflammatory cytokines, such as IL-12, IL-23, and IL-1, that promote IFN-γ-secreting CD4+ T cells and cytotoxic T lymphocyte responses . DCs represent key targets for 1,25-dihydroxyvitamin D3 (1,25(OH)2D3), which can directly induce T cells . After the addition of immune-inflammatory cells into an emerging hallmark of cancer , studies have shown that immune cells were associated with immunosuppression. Some types of immune cells have an innate function of immune suppression, and some cytokines can also activate them through different signaling pathways. The main immunosuppressive cells are regulatory T (Treg) cells marked by Foxp3+ , myeloid-derived suppressor cells (MDSC) marked by HMGB1 , and M2 macrophages marked by CD163+ [108, 112], which have emerged as a leading method in the development of new immunotherapeutics. Studies have also found that some granulocytes can promote cancer development through the expression of cytokines, such as the hematopoietic growth factor (HGF), granulocyte colony-stimulating factor (G-CSF), or inducing changes in stromal cells [113-115]. PD-1+ and cytotoxic T-lymphocyte antigen-4 (CTLA-4) expressed by “exhausted” CD8+ T cells are also targeting markers in treating patients with breast and non-small cell lung (NSCL) cancer [116-118]. In addition to the mutual activation , the antitumor effects also can be suppressed by some co-inhibitory molecules expressed by antitumor immune cells, such as PD-1/PD-L1 [120, 121]. Some antitumor cytokines can also promote immunosuppression, such as IL-10 and TGF-β secreted by DCs, which may activate Treg cells that are recruited to the tumor under the influence of the chemokines, including CCL22 and CXCL12 . As for these immunosuppressive cells, cell depletion strategies [122-125], tumor vaccines , intratumoral injection with an agonistic antibody , targeting the transcription factor, and suppression of activated receptors [128, 129] have been widely used in improving immune surveillance and promoting antitumor immune responses. Agonist antibodies of CD40, 4-1BB, GITR, and OX-40 can also be used to enhance antigen-specific T cell responses , CD25 antibody can be used to reduce the number of Treg cells or inhibit Treg function , and promote the maturation of DC and rational use of cytokines and antibodies to break the immune tolerance . The significant roles and the master markers of the immune and inflammatory cells are indicated in Table 1. Similar to normal tissues, the blood and lymphatic vascular networks supply oxygen and sustenance as well as removing carbon dioxide and metabolic wastes for sustaining the survival of neoplasm growth. These networks have two main features. First, the new vessels surrounding tumors are usually inefficient, tortuous, or leaky . Second, the angiogenic switch is almost always activated and remains active during the process of the tumorigenesis, resulting in continued growth of new natural blood vessels . In the tumor angiogenesis process, new blood vessels form from pre-existing vessels, making the blood and lymphatic vascular network more complex . The blood and lymphatic vascular networks have different roles during the stages of tumorigenesis . Tumor normal cells are confronted with the challenge of hypoxic surroundings . To survive in hypoxic circumstances, primary tumor cells may adjust to the low oxygen setting, or migrate to and recruit blood vessels . A selection shape can be chosen, which is more enterprising and metastatic, and is provided by a chronically hypoxic environment [139, 140]. In the process of tumor progression, one of the primary functions of the blood and lymphatic vascular networks is to help tumor cells escape immune surveillance. Escape measures are mainly divided into two categories. Directly, the lymphatic microenvironment will weaken or eliminate the normal function of immune cells. For instance, the myeloid-derived suppressor cells (MDSCs) and the immature DCs in the sentinel lymph nodes (SLNs) could restrict the normal operation of T cells [141-143]. When the metastatic tumor enters a novel environment, CD4+and CD8+ T cells may help them to evade the host immune system [144, 145]. The remodeling of unusual endothelial venules (HEVs) can indirectly influence immune cells to traffic into lymph nodes . Though some immune cells traffic into the lymph nodes through the draining afferent lymphatic vessels, lymphocyte recruitment into the SLN via HEVs is fundamental . Moreover, lymphatic vessels around the tumor also provide a physical link between the SLNs and primary tumor. When lymphatic vessels are obstructed, collateral lymphatic vessels can make up for the diminution in lymphatic capacity [144, 147]. This physical connection is like a highway through which tumor cells can reach other locations. Some phenomena showed that local tumor invasion correlated with excellent lymphatic vessel density in the tumor margin [148, 149]. 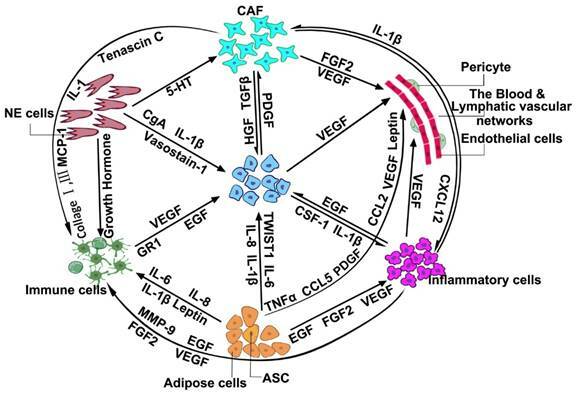 Figure 2 shows that through different interacting factors, adipose cells, inflammatory cells, and CAFs can also closely connect with lymphatic vascular networks [150-153]. The physical and chemical connection makes the role of angiogenesis in tumor formation more of a mystery. The important functions and the primary markers of the blood and lymphatic vascular networks are listed in Table 1. Banerji et al. found that the lymphatic vessel endothelial HA receptor (LYVE-1) was expressed predominantly in lymphatic vessels . Evidence suggests that VEGF is among the most important factors for anti-angiogenic treatment [155, 156]. A number of studies have discovered that VEGF would inhibit the development of new vessels, block the VEGF or its signaling pathways, prune pre-existing vessels, and induce vessel normalization [133, 157, 158]. Furthermore, clinical trials that targeted VEGF and other markers showed prolonged survival [155, 159]. Members of the VEGF family include placental growth factor (PlGF), VEGF-B, VEGF-C, and VEGF-D, which were also good candidates for anti-angiogenic treatment [133, 160-164]. Another marker, PDGFβ, secreted by sprouting ECs, has two sides of the effects on tumors. It would recruit prostate cancer (PC) signaling through the presenting PDGF receptor-β (PDGFRβ) . Studies have revealed that blockage of PDGFβ makes tumor vessels more sensitive to VEGF inhibitors [166, 167]. Consequently, the decrement of PDGFβ also enhances the risk of increased metastasis . Generally, anti-PDGFβ drugs play an auxiliary role in anti-VEGF treatment. Some other markers, such as CRISP-3 , CCR7 , GATA2 , Prox1 , and Foxc2  have also been found and are well used in the treatment. In conclusion, abnormal tumor vasculature exhibited remarkable spatiotemporal heterogeneousness, and not only damaged perfusion and drug delivery, but also made chemoradiotherapy less expeditious. Adipose tissue comprises two cell types, white adipose tissue (WAT) and adipocytes . The significant functions and major markers of adipose cells are shown in Table 1. Extensive evidence has proven that some features of adipose tissue are associated with cancer. First, obese adipose tissue hypoxia establishes a highly proinflammatory microenvironment, which is more likely to breed tumors [173-175]. Second, adipose cells also secrete more than 50 different cytokines, chemokines, and hormone-like factors [176, 177]. These factors, whose production may upregulate in obesity, may be accomplices in tumor initiation. Similar to interleukin (IL)-6, IL-8, IL-1β, tumor necrosis factor-α (TNF-α), VEGF, chemokine (C-C motif) ligand 2 (CCL2) and CCL5 [178, 179]. Third, in obese patients, adipose tissue accommodates a higher proportion of preadipocytes, in which figures of macrophages and monocytes synergistic increase . These alterations may also contribute to cancer development locally. Fourthly, adipose tissue reprogramming and the associated systemic secretion may have an effect on cancer growth and progression . Excess adiposity leads to high circulating blood estrogen  and chronic, low-grade inflammation, which is involved in cancer development [176, 182-184]. Cancer progression has been proven to be accompanied by recruiting progenitor mesenchymal stromal cells (MSCs) in reaction to setting factors free by TME with hypoxic and inflammatory conditions [185, 186]. Another type of cancer-associated adipose cell is the adipose stem cells (ASC), which have the capability to differentiate into multiple cell lineages [187-189]. ASC plays a chief role when it comes to the promotion of tumor progress. First, ASCs influence the tumor microenvironment (Figure 2). Eterno et al. suggested that ASCs may worsen the tumorigenic behavior of c-Met-producing breast cancer cells by creating a TME characterized by inflammation. The TGFβ1 signaling pathway may also play a role in the interaction between ASCs and the TME . Second, ASCs may promote angiogenesis . Gehmert et al. reported that ASCs might contribute to angiogenesis by migrating toward tumor-conditioned media through the platelet-derived growth factor BB/platelet-derived growth factor receptor-β (PDGF-BB/PDGFR-β) signaling pathway. Third, ASCs may differentiate into carcinoma-associated cells. In breast-cancer tumor models, many studies have found that ASCs may differentiate into fibroblasts and promote tumor proliferation . The same findings were also reflected in ovarian cancer and lung cancer progression [195-198]. Fourth, ASCs may promote EMT. Studies using pleural effusions or established breast cancer cell lines from breast cancer patients exemplified that either co-culture with ASCs or conditioned medium from could advance invasion and EMT of breast cancer cells [199-201]. Cancers are triggered by adipocytes to gain enterprising tumor phenotypes with some aggressive traits. In turn, cancer cells may express the corresponding markers. Although there is no unique marker for clinical identification, the increase or decrease in the number of a substance in adipose tissue may directly or indirectly reflect the initiation, progression, and invasion of the tumor, such as the EMT-like phenotypic alterations accompanied by the upregulation of matrix metallopeptidase 9 (MMP9) and TWIST1 [202, 203]. Higher aromatase activity and higher degrees of obesity may abate the efficacy of aromatase inhibitors . Leptin, an adipocyte-derived cytokine, would arouse proliferation in some cell types, such as mammary epithelium, which has an effect on the neoplasm cell proliferation, apoptosis, and cell cycle [205-207]. Data has shown that high glucose levels can induce leptin signaling directly . Additionally, adiponectin in given cells may inhibit proliferation promoting apoptosis through the adenosine monophosphate kinase (AMPK) and MAPK pathways . Certain types of cancer have found adipose-related target markers. For instance, methyl-CpG-binding protein 6 (MBD6) is a direct target of octamer-binding transcription factor 4 (Oct4) and controls the stemness and differentiation of adipose tissue-derived mesenchymal stem cells (ASC). Aromatase is one of the newly discovered adipose-related markers for postmenopausal breast cancer. The majority of postmenopausal breast cancers are estrogen receptor (ER)-positive. Obesity results in the secretion of inflammatory factors, which stimulates the expression of the aromatase enzyme and converts androgens into estrogens in the adipose tissue . Several clinical trials have revealed that many pathways could be targeted to specifically inhibit aromatase within the breast. For example, through targeting aromatase inhibitors (AIs), clinical treatment may inhibit the activity of aromatase enzymes and prevent estrogen production . Although targeted therapy has achieved promising results, it also has certain side effects. In the late 1920s, Siegfried Oberndorfer found that the secretion of nerve cells in the hypothalamus enters the blood . These cells are now called neuroendocrine (NE) cells, and a series of experiments proved that this type of cell exhibits a combination of neuronal and endocrine features . In healthy organisms, normal NE cells play complex local regulatory roles at the tissue level . NE cells are part of the diffuse NE system, which is spread throughout the normal organism. They can also be found within endocrine glands or tissues, such as the hypothalamus, anterior pituitary gland, pineal gland, thyroid gland (calcitonin-secreting cells), thymus, breast, and the pancreatic islets of langerhans [212, 214, 215]. Under the electron microscope, two different morphologies were found: open-type cells and closed-type cells . There is no difference in the location of these two kinds of cells, but the function is not the same, which increases the difficulty in studying NE cells. NE cells are the accomplices of tumor formation . Extensive evidence has proven that the NE system strongly influences the function of the immune system (Figure 2). The NE system can regulate the migration and cytotoxicity in NK cells through neurotransmitters . Additionally, substance P showed the ability to block the β1-integrin-mediated adhesion of T lymphocytes  and increase their migratory activity . Substance P also can induce the production of various cytokines in leukocytes . Norepinephrine, another neurotransmitter, also showed a significant impact on T cells . It could inhibit the generation of antitumor cytotoxic T-lymphocytes (CTLs) through the inhibition of TNF-α synthesis . On the other hand, as a result of their secretory products, NE cells could stimulate the proliferation of prostate carcinoma cells and increase their aggressiveness , while in the development of NE-cell tumors, NE cells may play a leading role . NE carcinomas are rare malignancies that originate from the hormone-producing cells of the body's NE system. While there is no conclusive evidence, several studies have reflected on this conclusion. For example, one result showed that androgen-dependent lymph node carcinomas of the prostate (LNCAP) could only develop in the presence of NE tumors in castrating mice, which proved that NE tumor cells may secrete specific factors . NE tumors had a highly internal heterogeneity, and there were 13 different types of NE cells . Different NEs produce different secretions, which leads to different or mixed symptoms. NE tumors are also highly aggressive. Approximately 50% of pancreatic NE tumors have hepatic metastases  due to the secretion of several peptide hormones. To improve the survival rate of NE tumors, it is becoming more and more urgent to find specific markers. The significant functions and the major markers of NE are shown in Table 1. Many markers have gradually been found to be expressed in a large number of prostatic NE cancer cases, such as K18 and K8 cytokeratins , α-methylacyl-CoA-racemase (AMACR) , plasma anterior gradient 2 (AGR2) , and PGP9.5 . Additionally, neuron-specific enolase (NSE) and chromogranin A (CgA) may be the most frequently expressed neuropeptides [231-233], but they also have limitations in sensitivity, specificity, reproducibility, etc. . IL-2 was more specific than any marker other than Ki-67 in detecting gastroenteropancreatic NE tumors , even though some other targeting markers were promising for use in clinical treatment. Novel TDP-A-loaded and KE108-conjugated unimolecular micelles exhibited the best potential in suppressing NE cancer cell growth both in vitro and in vivo . There also have also been some achievements in the fields of prostate, lung, pancreas, and gastrointestinal tracts. Delta-like canonical notch ligand 3 (DLL3) proteins are expressed on the surface of pulmonary NE tumor cells but not in normal adult tissues. One multiple model in vivo showed that a DLL3-targeted antibody-drug induced durable tumor regression . In addition, more than 85% of lung cancer patients are diagnosed with NSCLC, while the other 15% are classified as small cell lung cancer (SCLC) [238, 239]. All the SCLC patients show histological features of NE morphology. Synaptophysin (Syn), and neural cell adhesion molecule 1 (NCAM1) are known as NE diagnostic markers. One recently study result showed that the positive expression rates of these three markers were 112 (58.3%), 160 (83.3%), and 166 (86.5%), respectively, in a total of 192 SCLC patients . In addition to targeted therapy, peptide receptor radionuclide therapy is a promising new treatment modality for inoperable or metastasized gastroenteropancreatic NE tumors patients . Some studies have found that EGF receptor inhibition may disrupt some signaling cascades, which may inhibit the growth of foregut NE tumors/pancreatic NE tumors . Another result also proved that PRCRT is an effective treatment in patients with FDG-avid NE tumors, even in patients for whom conventional therapies have failed. Recent genomic profiling studies, which have demonstrated that prostate cancers with an NE phenotype are enriched for loss of RB, loss or mutation of TP53, loss of AR, and AR target gene expression, and overexpression of MYCN and AURKA, may also provide a new treatment method . ECM, a dynamic and complicated environment, is characterized using biophysical, mechanical and biochemical properties specific for each tissue. ECM contains all the cytokines, growth factors, and hormones secreted by stromal and tumor cells. Many assays have respectively demonstrated ECM components, including collagens [245-247], laminins , fibronectins , proteoglycans , and hyaluronans [251, 252] in a specific organization . In vitro, one three-dimensional (3D) model indicated that ECM heterogeneity is crucial for controlling collective cell invasive behaviors and determining metastasis efficiency [253-262]. Because of the complexity of ECM heterogeneity in vivo, its influence on collective cell behavior has been described but not quantified . Depending on the different organization and locations, ECM has complementary effects on the development and metastasis of tumors in diverse ways. First, ECM may affect tumors through extracellular secretion. During embryogenesis, fibroblastic mesenchyme determines the sexual phenotype of the gland, while the adipocyte mesenchyme controls mammary-specific ductal morphogenesis [263-266]. One study illustrated that innate ECM scaffolds, derived from decellularized tissues, lead the cells derived from stem cell differentiation that reside in the tissue from which the ECM was derived . Second, ECM may alter the phenotype type of stromal cells or tumor cells. Oncogenic mutations are broadly thought to increase cellular fitness and result in the clonal expansion of receivers. One experiment revealed that the ability to clean apoptotic colon cancer cells can be promoted by tumor-associated macrophages (TAMs) through the expression of sulfoglycolipids (SM4s). During this procedure, phenotypic change of TAM was accompanied by expression of TGF-β1 and secretion of IL-6, which may have an advantage in further activating the angiogenic process . Third, ECM can help neoplasms to get away from immune surveillance. For instance, colon cancer cells always display an increased production of Fas ligand binding to its receptor on immune cells . Fourth, the ECM tumor will provide a hypoxic or acidic environment in which the tumor cells have greater survival advantages than normal cells. ECM will select survival cells to aid in tumor growth and invasion at the fastest rate. Tumor management strategies include surgery for a cure or for cytoreduction, radiological intervention, chemotherapy, and somatostatin analogs to control symptoms. However, tumor cells are extremely elastic and may adapt to treatments and environmental modifications speedily [270-277]. Once one component has been obstructed, other mechanisms will quickly follow. This may be one of the main factors that lead to poor prognosis. The major interaction between different stromal cells and active factors in the advanced TME is shown in Figure 2. Different impeding mechanisms at the same time might lead to the best results of tumor development. In other words, it is important to understand the role of different components of the TME in the treatment and prevention of tumors. Moreover, the study of predictive biomarkers, which may fully address the complexities of the biology, will promote the development of therapies tailored to individual patients. At present, the emerging targeted microenvironment therapy has been widely accepted. According to the characteristics of different tissues, the synergistic therapies targeting multiple microenvironment stromal cells and the continuous discovery of multiple target markers may be the direction of future research.